A whole of Busking Goin On . . .
Ahoy there viewers . . .
A little bit of hokum . 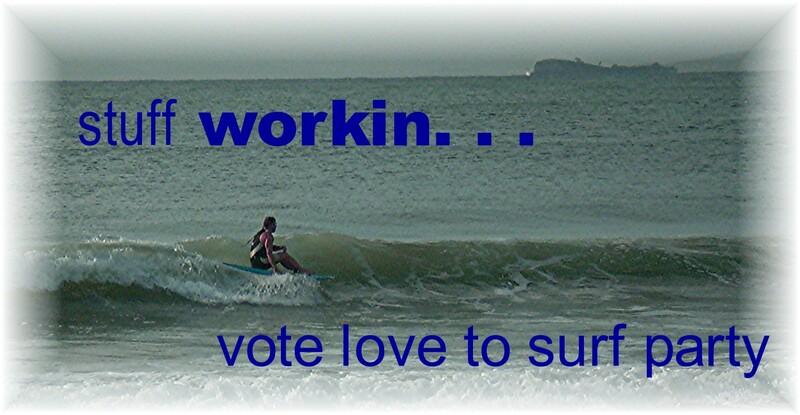 . . as well as busking I like surfing and laying around under a Pandanus Palm . . . this video was taken by my bro Tim at a funky little Cafe called The Ofis near Honiara on Guadalcanal in the Solomon Islands in 2015 . . . The surfboard hanging on the wall was made by my old friend Allan Byrne from Gisborne . . . we lived together at Miami on the Gold Coast in the seventies . . . Allan Byrne died in Bali a few years ago . . . Byrnesy was a NZ surfing legend and innovative shaper and designer of fins . . . checkout the film Last Paradise which shows adventures of a young Al Byrne and other kiwi surfers making some big whoopee in the water . . . in the air . . . and on the mountain. RIP Al The song is for the flat earthers ! 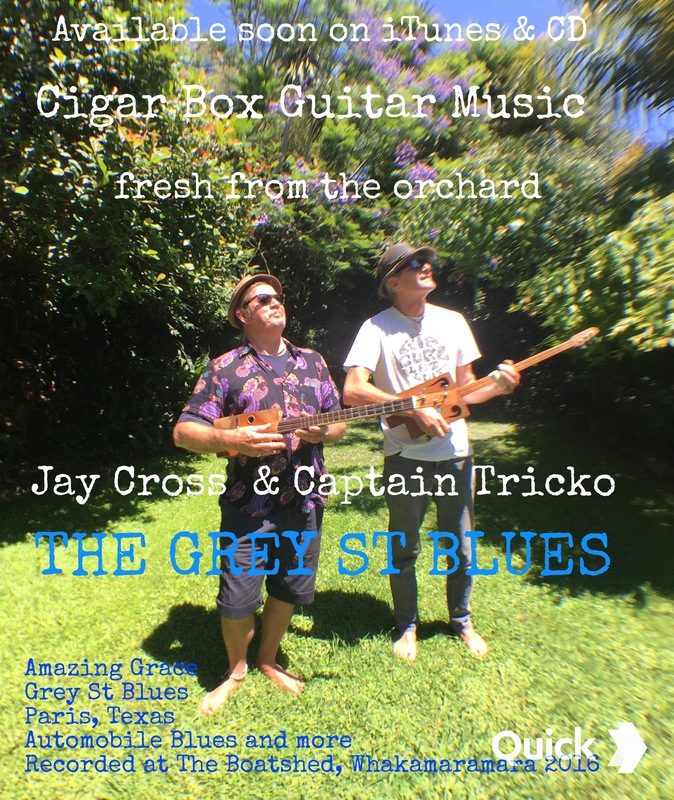 BLUES ON GREY STREET Feb 2016 Captain Tricko recently returned to sunny Queensland . . . is resurrected, revived, rescucitated, revamped & revitalised . . . He spent five weeks busking , surfing & socialising in the Land of the Long White Cloud . . . 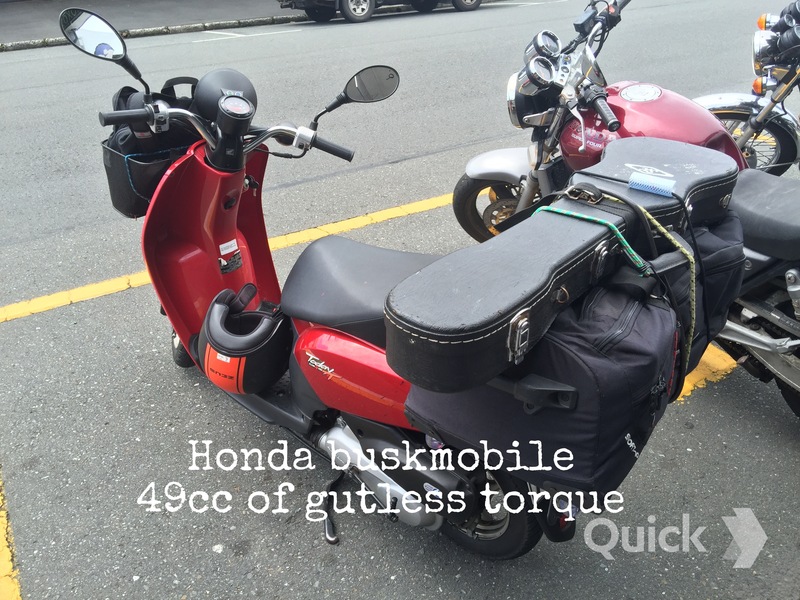 Played some market & cafe gigs , cruised around Mount Maunganui on a Honda Today 50cc moped busking for cruise ship passengers . . . Reunited with some old friends and family . . . Played some bad golf . . . ate a lot of seafood and became a lttle more educated about wine . . . and beer . . . & serious bbq ! 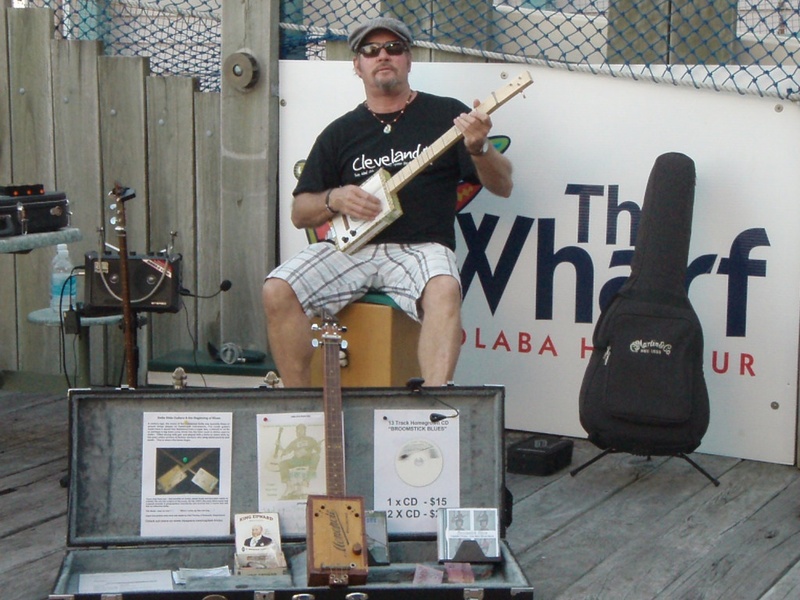 The highlight of this tour was collaborating with fellow busker & cigar box guitar player Jay Cross . . . Together they recorded a cool 8 track cigar box guitar music CD titled THE GREY STREET BLUES . . . An organic, lo fi , one take confection played on 3 string cigar box guitars orchestrated and recorded by a sonic magician called Nigel Masters at The Boatshed Recording Studio in Whakamaramara. Below is an audio link to Doghouse Blues one of the tunes we recorded on the day . 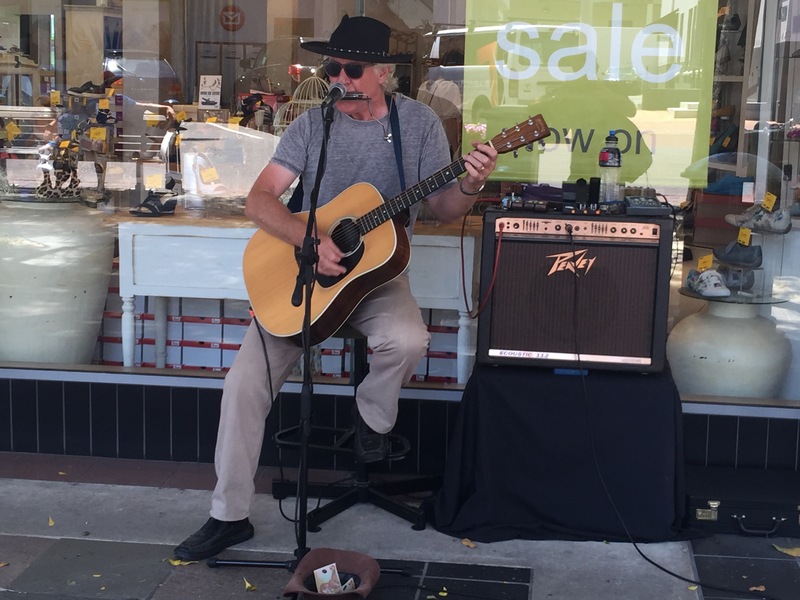 . .
Also met a wonderful busker called Noel Beasley who plays in Grey St, Tauranga every Saturday during the NZ summer . . . All the good street musicians seem to gravitate to Grey St . . .
Grey St is a nice street in the middle of Tauranga CBD with shopping arcades , shaded public seating and a public toilet with hot running water ! In testimony to this great meeting place for street performers Jay & The Captain titled the Boatshed recording of their cigar box guitar music collaboration ” THE GREY STREET BLUES “. Soon be available as an EP on CD & iTunes. More details & video of Jay Cross busking will be posted here soon ! Where is the best place to busk ? I have been asked this question a hundred times . . . Definitely not in a doorway & definitely somewhere that you feel good, relaxed & welcome . . . Setting up on a busy thoroughfare can get great results . . . But interrupting pedestrian access won’t make you popular . . . This guy was asked not to busk in front of the shop windows . . . So he moved to the doorway . . .
LORD HAVE MERCY ! ! ! Busking as a way of life . . . Those who busk professionaly are amongst the most noble people I have met . . . a long time ago this man encouraged me to put my hat out . . . encouraged me to champion street performers . . . encouraged me to reach deep into my soul . . . and find what exists there. Busking in Bali is not a good idea unless you are Indonesian. Although international artists have been invited to the 2015 Bali Arts Festival I was warned by locals that an impromptu street performance may be deemed as ” work “. Arrest… Jail… Bribery… were all strong possibilities if the ” bule ” breaks out in song on the street from the Indonesion authorities. So I only took my harmonica … reasoning that I would avoid trouble by pretending to purchase the shakers & maracas offered at every stall on the crumbling dusty streets of Sanur. My inflatable standup paddle board was invaluable to help pass the time as there are nice uncrowded waves at Sanur Beach … As was my new dentist Retno Agung across from McDonalds. 10 days into my Indo experience I am missing twanging & banging on my guitar & stomperine … So I have gone to Lembongan to find a maraca & any other locally made percussive item that I can use to accompany my moaning harmonica. No police on Lembongan so I although I won’t busk here I will sit on the steps under The Reef Cafe and shake my new maraca & blow my harp at sunset … Just to give my soulful vibrations some air … Looking round the backstreets of the island for a suitable maraca /shaker/kalimba has been fun … At a friendly looking stall I pull out my harp … Pick up any one of a number of shaker contraptions … Start blowin & shakin … And watch the faces of the locals who gather round … They all want to sell you their stuff … Some pick up a drum or another shaker and get into the spirit of the thing … I am just happy making some music again ! ! ! THEY ALL LIKED IT !!! I bought SUN SALUTE their 5 track CD and I can tell you folks it is a cool confection of tunes. Then I got to talking . . . with the Sun Salute singer Hayden Wiki . . . turns out Hayden & I went to the same college Lytton High School in Gisborne, New Zealand. He is one cool dude and like most of my Maori friends Hayden can harmonise without effort. Appropriately the third track on the SUN SALUTE CD is titled ” HE WHAKAARO ” and is sung entirely in the Maori language. Thanks Sun Salute & Kia Ora to the Whanau back in New Zealand !! !